We often hear from users that have scans of old books that they'd like to upload, but they're not sure of the copyright status of the document. 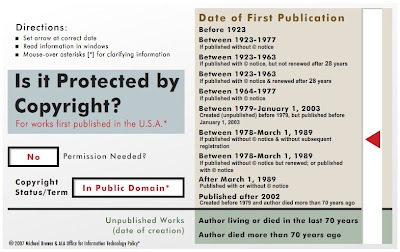 Michael Brewer at the ALA Office for Information Technology Policy has created a unique slide rule that provides an overview of the general probability of copyright protection for legacy content published in the United States. Check it out if you're ever unsure of a document's copyright status.